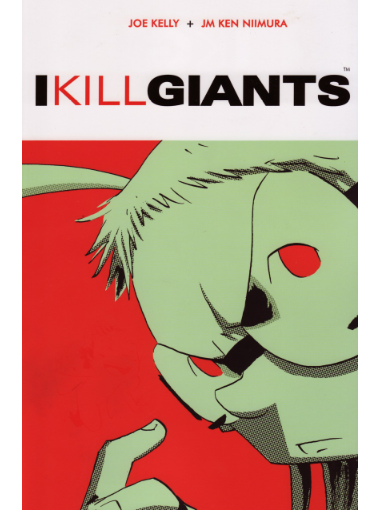 I Kill Giants, by Joe Kelly, illustrated by J.M. Ken Niimura (Image Comics, 2010) is a moving, intelligent, and exhilarating story of a pre-teen outcast girl who sports bunny ears, is bullied, picks fights, plays Dungeons & Dragons, and most importantly, hunts and kills giants. Something terrible is happening in the upstairs of her house, which the reader soon suspects is a sick or dying mother, but our protagonist, Barbara, finds it easier to fight monstrous creatures than face her ailing parent. As the story unfolds, we find ourselves rooting for Barbara, as she develops her first real friendship with a new girl in school, slowly grapples with the monsters in her life, and learns that she is stronger than she thinks. The story is done entirely in black and white and has many manga qualities. The overall feel is loose and spontaneous, and every frame is beautiful and interesting to look at. The images seamlessly blur fantasy and reality, all the while perfectly conveying the story's messages of love, fear, hope, and redemption. 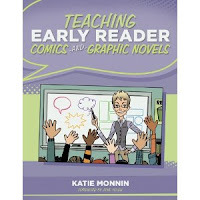 Teaching Early Reader Comics and Graphic Novels, by Katie Monnin (Maupin House 2011) Dr. Monnin’s new book is an excellent resource for elementary school teachers and librarians who want to teach graphic novels to emerging and advanced readers. Her premise is that graphic novels are an important genre to teach because they combine both words and images that must be decoded simultaneously. Because of this quality, graphic novels are uniquely situated to help make traditional readers out of children who are accustomed to interpreting images through visual and electronic media but have not yet bridged the literacy gap. In addition, she believes it is equally critical to teach a literacy that combines images and words given the real world communications that rely so heavily on being able to grasp both images and text. 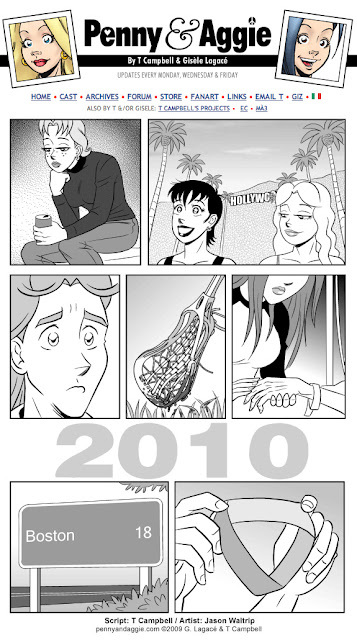 The book introduces the basic elements and terminology of comics, covering both simple terms appropriate for K-1st grades (panel, gutter, ballons) and more advanced concepts for older grades, such as the seven types of panels (plot, character, setting, conflict, rising action, climax, and resolution) and Scott McCloud’s classification of transitions between images: moment-to-moment, action-to-action, subject-to-subject, scene-to-scene, and aspect-to-aspect (she excludes his more esoteric “non sequitor” category). 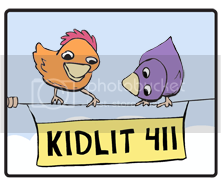 The book provides detailed teaching guides and lesson plans for emerging and striving readers in K-1st grade and 2-3rd grade, and for proficient and advanced readers 4th grade and up. Each chapter provides lists of graphic novels appropriate for the reading level; how they relate to the International Reading Association Standards for the English Language Arts (IRA/NCTE standards); and sample lessons plans and teaching exercises. Dr. Monnin includes a chapter on teaching multicultural graphic novels, including reading lists. I was not familiar with many of these titles, though some of the ones I was familiar with did not necessarily strike me as multicultural (The Essential Calvin & Hobbes; Diary of a Wimpy Kid; The Unsinkable Walker Bean). I received a free copy of this book to review through Library Thing's Early Reviewer program. 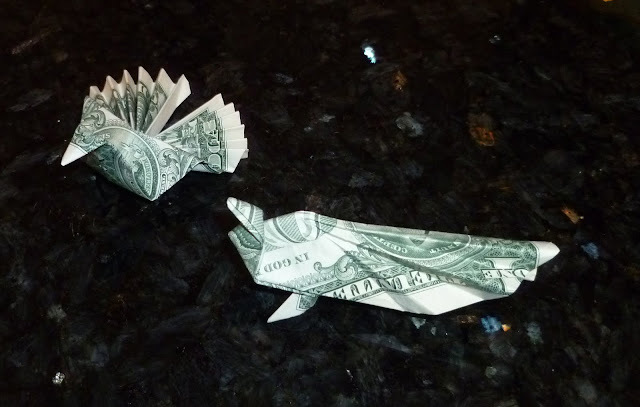 A week or so ago, the tooth fairy visited our house and left these origami peacocks made of dollar bills. My kids have loved getting these from the tooth fairy over the years. They've gotten boots, ninja stars, hearts, rings, giraffes, butterflies, fans, and other fun shapes. I'm not sure where the tooth fairy learns how to make them, but there seem to be a lot of nice websites that give excellent instructions. A couple that are simple to follow are: Money Origami (A thru H) and Money Origami (H thru Z). Sometimes it helps to follow a video that you can pause while following along. For example, here's a video showing how to fold a peacock like the one above. T Campbell, a “comics scriptwriter, just-plain-word writer, cruciverbalist, teacher and all-around creative dynamo,” graciously met with me to talk about his work. His web comics, crossword puzzles, and other writings can be found at T Campbell’s Things. Q. Tell me about your web comics. 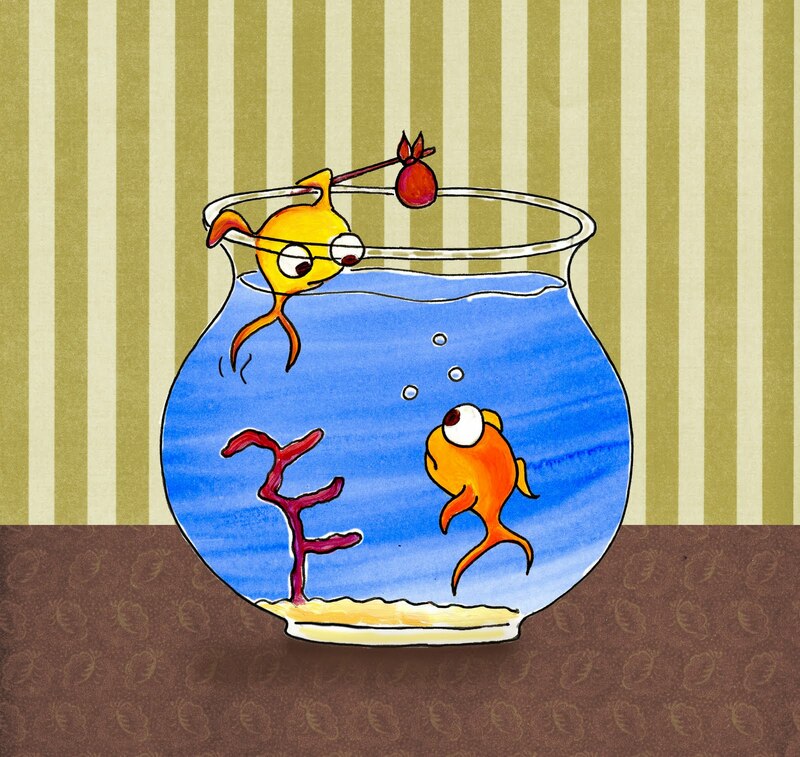 What are your currently active series, and what is the one-line elevator pitch for each? Penny and Aggie: The prom queen, the class weirdo and the bond between them that neither one can explain. Fans: Science-fiction fans facing science-fiction situations. Guilded Age: The saga of the working-class adventurer. Widgetitis: Tech is forever changing our lives. Hilariously. Q. How did you end up writing web comics? I knew I wanted to be a writer since childhood, but I was slower to figure out what form the writing would take. I always loved comics as a child and through high school. At one point, I discovered that one of my favorite science fiction novelists, Peter David, was also a comic strip writer. That put the idea in my head that comics could be a part of the overall picture. Initially, I had the idea that I had to be successful in a specific form of comics. My first traditionally published comic was Fans in 1999. I found the right artist, Jason Waltrip, submitted to the right channels, and got six issues published. I later realized that we had done incredibly well, considering it was an unknown series by an unknown author and a relatively unknown artist. In January 2000, we used the internet to pick up where the print publication left off. Q. How many artists do you work with? Currently it's three: Jason and John Waltrip (Jason on Penny & Aggie and Fans, John on Guilded Age) and Chris "Doc" Marten (Widgetitis). I also do some behind-the-scenes work for writer-artist Gisele Lagace, her co-writer Dave Zero, and her assistant, whom I know only as Shouri. Q. What is your typical workflow, for example, for a series like Penny & Aggie? You have to leave room for your characters to surprise you and for both you and the characters to surprise the reader, so all but two of these little moments were taken from the beginning of their respective stories, the moments where those stories really get under way, what Syd Field would call the first-act turning point. Taking just the first of those frames as an example: I knew that I wanted the series' cutest couple, Jack and Katy-Ann, to go through a rough time as Katy-Ann suspected Jack of returning to a binge-drinking habit. I knew she was going to try drinking herself, to try to understand its hold on Jack, but I asked Jason to have her worried and contemplative in a pose close to Rodin's The Thinker. (I wish all my ideas were so educated-sounding.) I was pretty sure it would end with the two of them stronger in love than before, but not 100%. 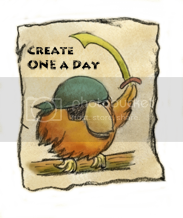 When it came time to write the story, I started as usual by writing a page-by-page outline, with a shorthand line of text describing what would happen on each page. Then, also as usual, I wrote the dialogue first, only using line breaks to separate pages, not individual speakers or even frames/panels. I knew who was speaking each line, knew how most of the panels would break down and at least had an idea what would happen visually on each page, but none of that was being written at this point. It was another kind of shorthand, really, and I've found it useful because it lets me keep an eye on how many total words I've put into the text of a page. Once the dialogue was done, I added the breaks, then added the panel descriptions, added the speakers, and finally added the emphases-- putting a few of the words in boldface, to communicate how the dialogue should be "heard." Then I sent it to my editor Greg, who gave me line-editing and validation, and my editor Maritza, who made me rewrite two pages and question everything. Then I passed it to Jason. I'm always on hand to answer Jason's questions as he draws, but my work was still pretty much done after that. Q. You teach a class on writing graphic novels. What are the handful of graphic novels that everyone should read, whether or not they are interested in comics? (3) The Complete Calvin and Hobbes, by Bill Waterson. Q. What are some of your favorite webcomics? David Willis is my favorite comics writer who isn’t me. He inspired me in a lot of ways. Two of his strips are: Shortpacked and Dumbing of Age. Other web comics I enjoy are Out at Home, Out There, and Bobwhite. Q. If someone wanted to create comics, what resources would you suggest? (3) Comics and Sequential Art, by Will Eisner. Also, an excellent online resource is http://www.webcomics.com, which is a subscription-based service ($30/year) that provides practical cartooning advice. Q. Is there a difference between graphic novels and comics? There’s a difference, because people believe there is? Actually, many graphic novels began as serialized comics, like Watchmen. Only after they were collected together were they called a graphic novel. Even literature like The Scarlet Letter started in serial form. If you are trying to create a graphic novel out of whole cloth, then the marketing and expectations are different than for web comics or the comic market. T Campbell is based in Norfolk, Virginia, and can be reached on Facebook and Twitter. Much of his work can be found at T Campbell’s Things. Individual feeds are available for Penny and Aggie, Fans, Guilded Age, and Widgetitis.